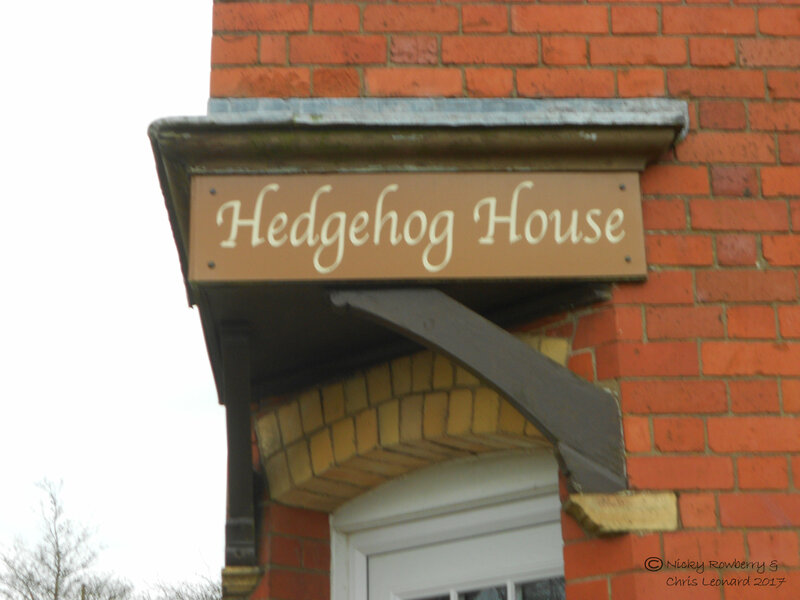 Today marks the start of Hedgehog Awareness Week – an annual event focussed on all things hoggy, organised by the British Hedgehog Preservation Society. 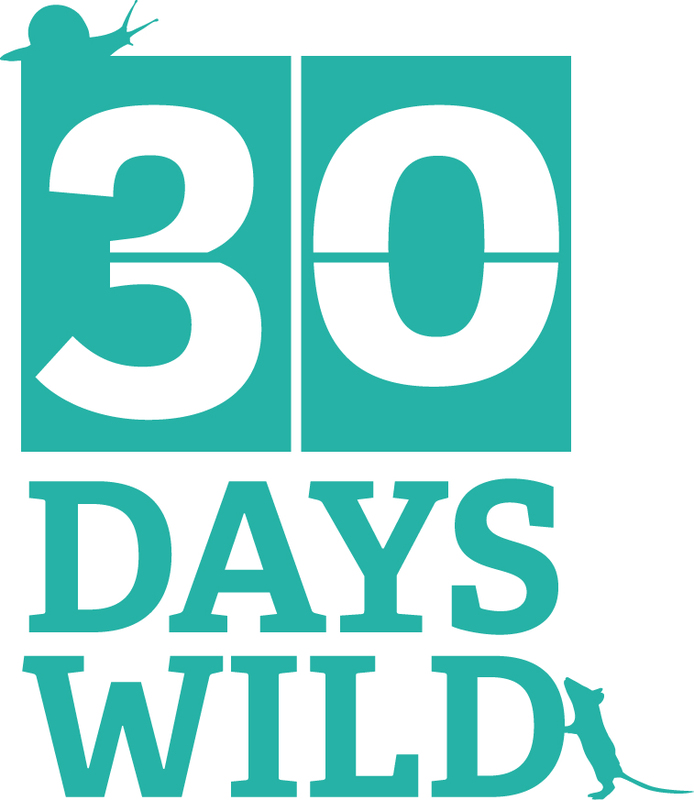 I’ve been saving up hedgehog related news for a few weeks now, in readiness for Awareness Week and I’ve got a surprising amount to report! 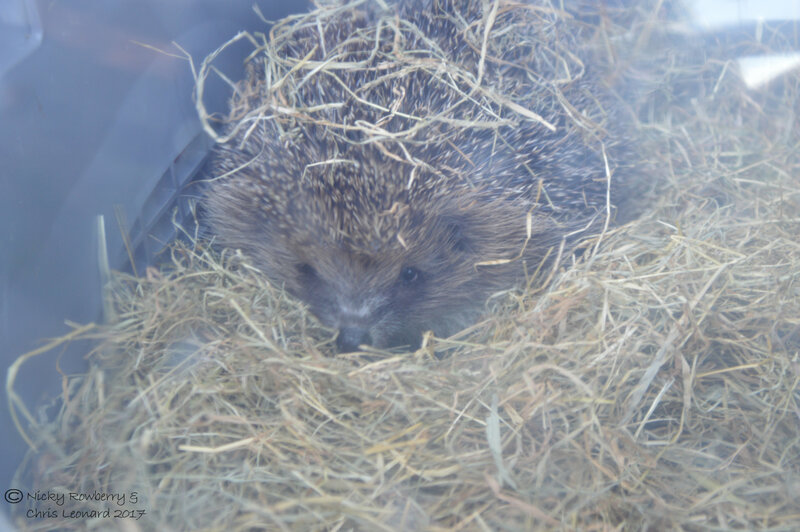 The next big piece of news is that Meadow our foster hedgehog has now been released into the Too Lazy To Weed garden. I took him back to be checked over by Viv at Malvern Hedgehog Rescue before we released him. This is him in the cat basket on the way there. Viv checked his weight (he’d actually put on a lot of weight as apparently the catfood he’d been on for the last few weeks was a bit rich for him – I’ll know better next time) and then gave the go ahead for him to be released into our garden. He’d been with us since January and in a way I was sorry to see him go, although obviously it was the right thing to do. We waited until dusk, then put the cat basket out under the apple tree where there was plenty of cover for him and just let him come out whenever he was ready. (I was tempted to have the Born Free theme tune playing the background but resisted) This is him emerging from the cat box and taking his first steps in our garden. I left the trail cam out for the next couple of nights and sure enough he appeared, making a beeline for the food I’d put out. I’m fairly sure it’s him in these next 2 clips as it’s a pretty big hedgehog so I reckon that’s our boy! Assuming it is him, he seems to be doing well and has obviously found somewhere safe to rest during the day and knows where I put food and water out each night. Live long and prosper Meadow! 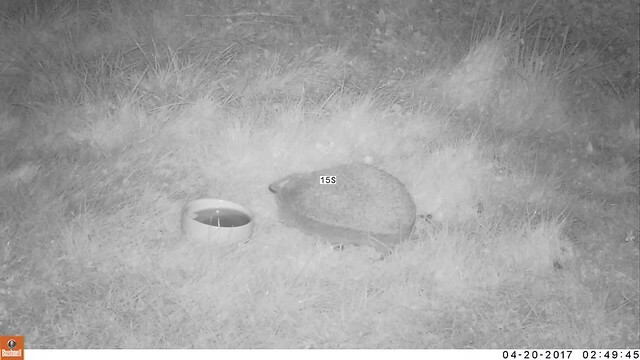 I’d been putting the trail camera out in the hope of getting hoggy videos for a few weeks before Meadow’s release. 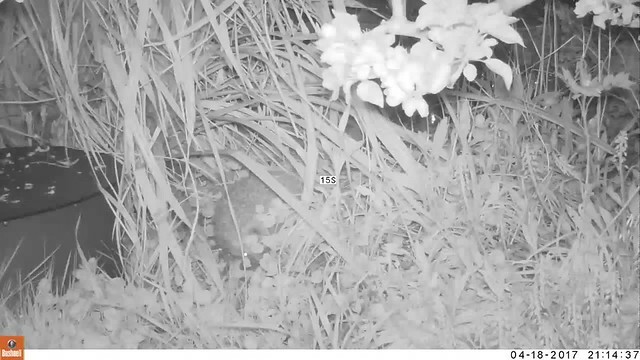 Most of the footage was of course taken in the dark, but I got this one short film of a hedgehog in the very early hours of the morning in daylight (I think the camera’s clock was out by an hour or two though as it wasn’t this light at 04:30am). Hopefully he or she was just getting a last minute snack before hiding away for the day somewhere. 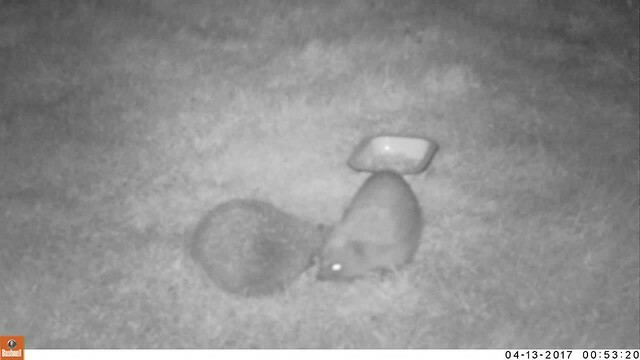 It’s never easy to distinguish the hedgehogs in the garden (apart from Meadow’s currently distinctive chubby form), so it’s difficult to know how many we get. 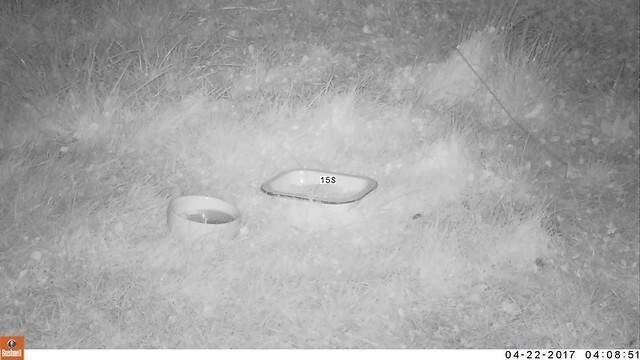 But a lot of trail cam footage shows a pair of hogs, so we know we’ve got at least 2 (3 now with Meadow). The first time two appeared together it looked like a fight! 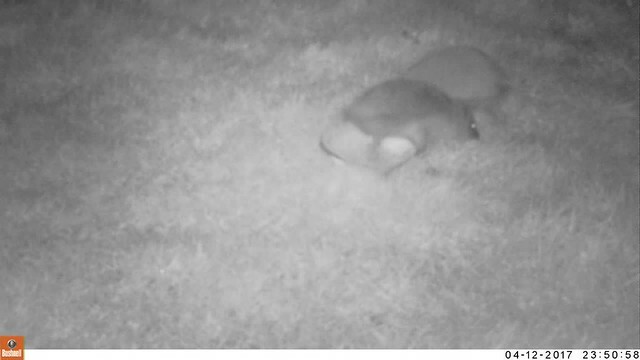 Don’t know if it was a territorial dispute between 2 males or an overly aggressive male and female, but the one managed to shove the other half way across the lawn. The following night though there were 2 hogs again. Not so aggressive this time, although the one did seem to be seriously annoying the other. They circled round like this for well over an hour – was it perhaps the start of mating, with the female playing hard to get initially. 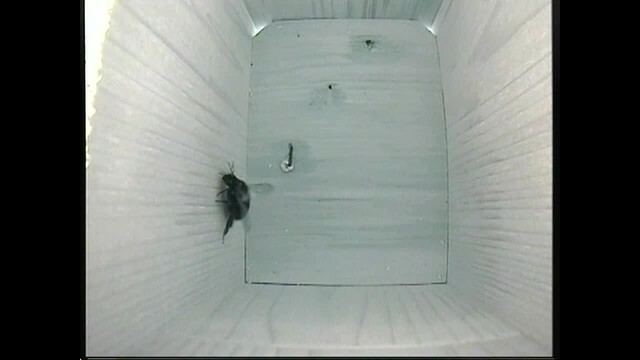 Have to admire his persistence if it was courtship, although he did seem to get distracted by the food bowl quite often! 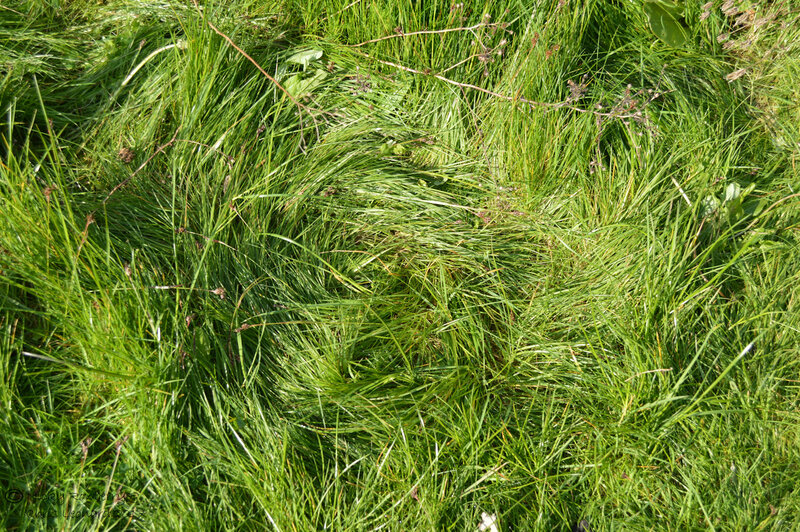 A few days after seeing the possible amorous antics on the trail cam, we spotted several areas of grass, flattened and twisted around – presumably the result of all the circling behaviour. You’ve heard of crop circles, we’ve got hedgehog circles! So that’s all the news from our garden. If anyone wants to do something extra to support hedgehogs during Awareness Week, there are lots of things that can be done. To support or encourage hedgehogs into your own garden, you can put out food (never bread or milk) and water. If you have a pond, make sure you install a ramp or some other means for hedgehogs to get out if they fall in. Make sure there are gaps in fences/walls so hedgehogs can come and go between gardens – they roam quite a bit during the night so ideally need a large network of gardens. Be super careful when mowing, particularly with strimmers which can inflict terrible injuries on hedgehogs. If you don’t have a garden or at least don’t get hedgehogs in it, there are still lots of other ways of supporting them. You could join BHPS – your subscription will help support their work. Or you could simply Text HHOG17 to 70070 to donate £5 to the charity. Another great example is Little Silver Hedgehog run by Emma. 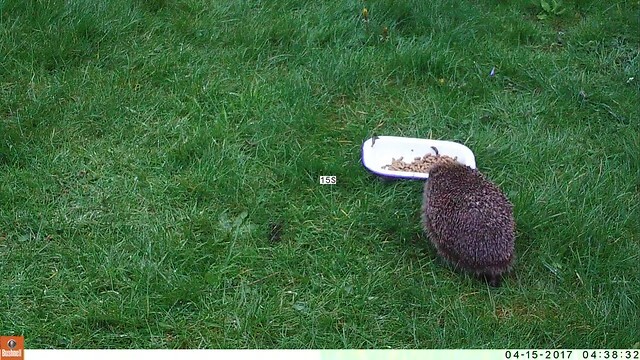 Not only does she rescue & rehabilitate lots of hedgehogs, her blog https://littlesilverhedgehog.wordpress.com/ is full of useful hoggy advice. 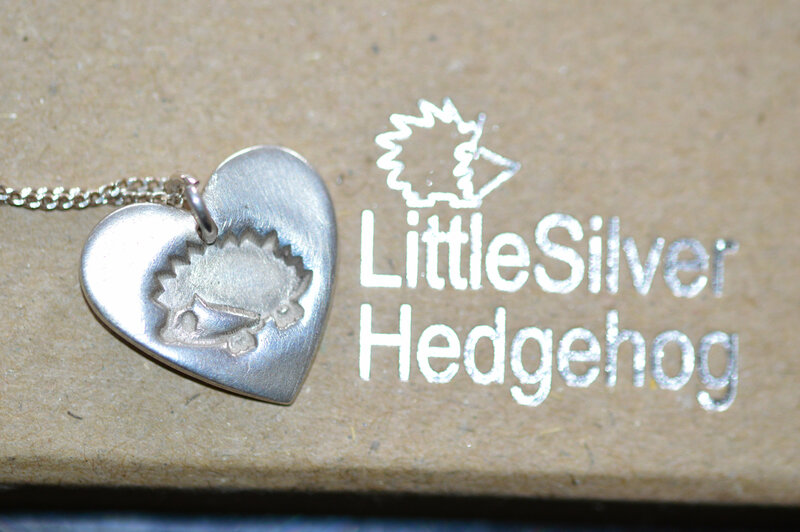 In addition she makes beautiful silver jewellery that she sells to raise funds for the hedgehogs – I treated myself to this cute pendant to celebrate getting the job with BHPS. And finally you could always just tweet or post a message on Facebook (or go old school and talk to people) showing your support for these lovely animals – they need all the help they can get. I’ve not managed to blog anything in the last few weeks, but it’s not been for lack of things going on in the garden. Almost the opposite in fact – spring is here and so much wildlife in our garden is stirring, that I can hardly keep up with it! 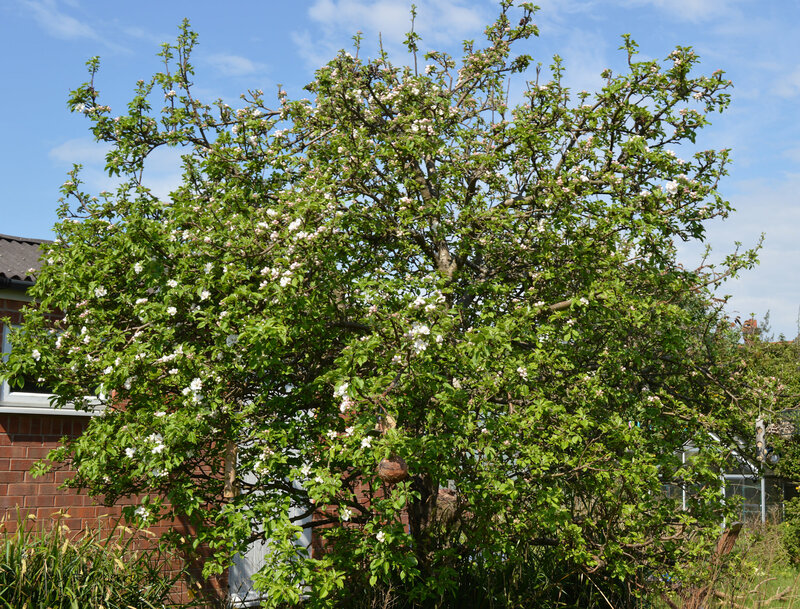 The apple tree has been in full blossom the last few weeks. 2017 seems to be one of those years where the whole tree turns pinky white with flowers. 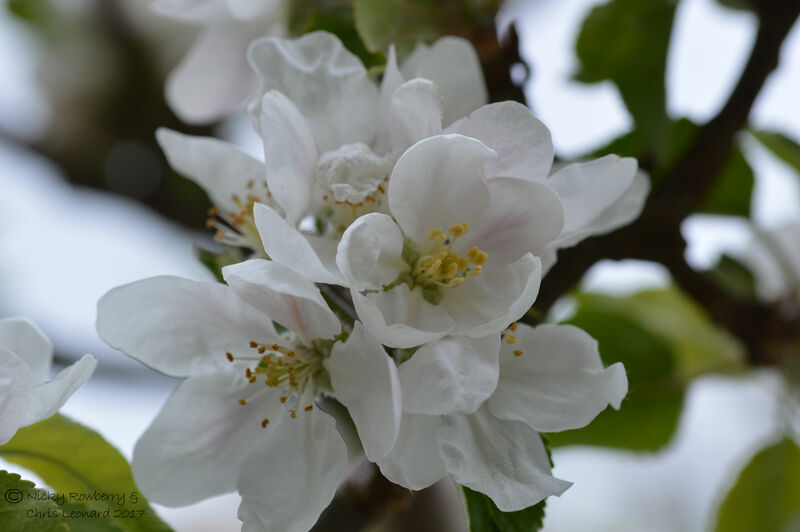 Comparing this year’s photo (top) with 2016 (below), there is a huge difference in the amount of blossom. 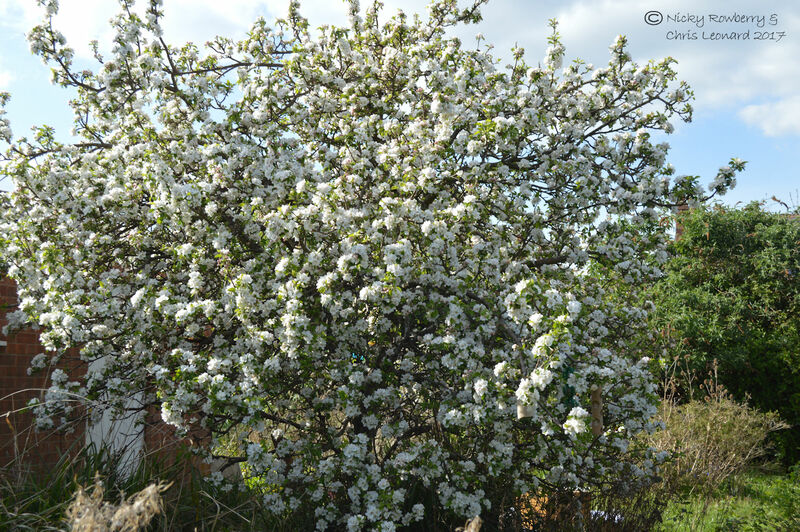 It is also in full flower a lot earlier – this year it peaked mid April, last year what little there was peaked in early May. Due to the mild winter or just a natural cycle? 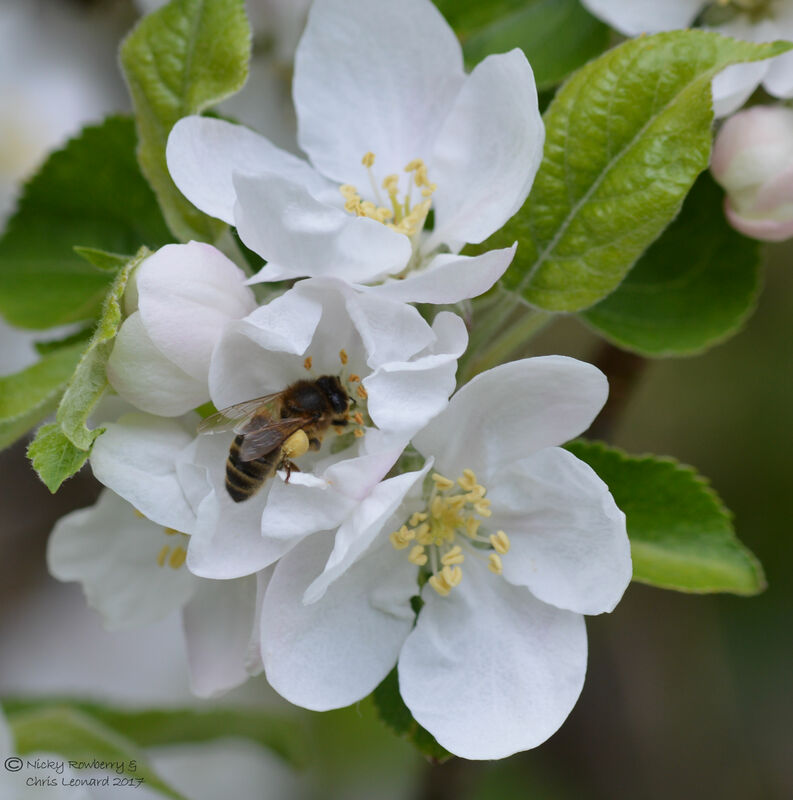 With an apple tree full of blossom, you would of course expect a load of bees. 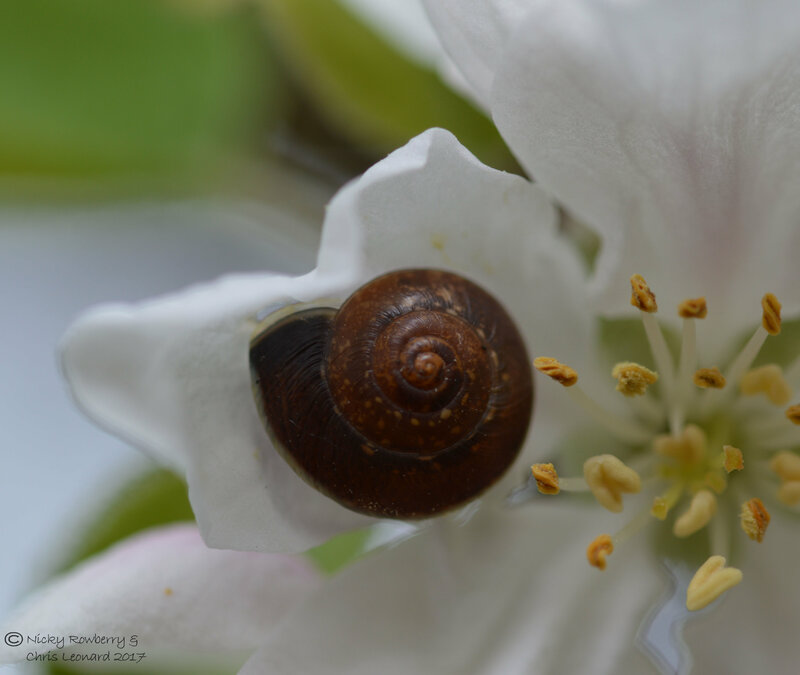 What I hadn’t expected was this Girdle Snail sitting pretty in the middle of it all! 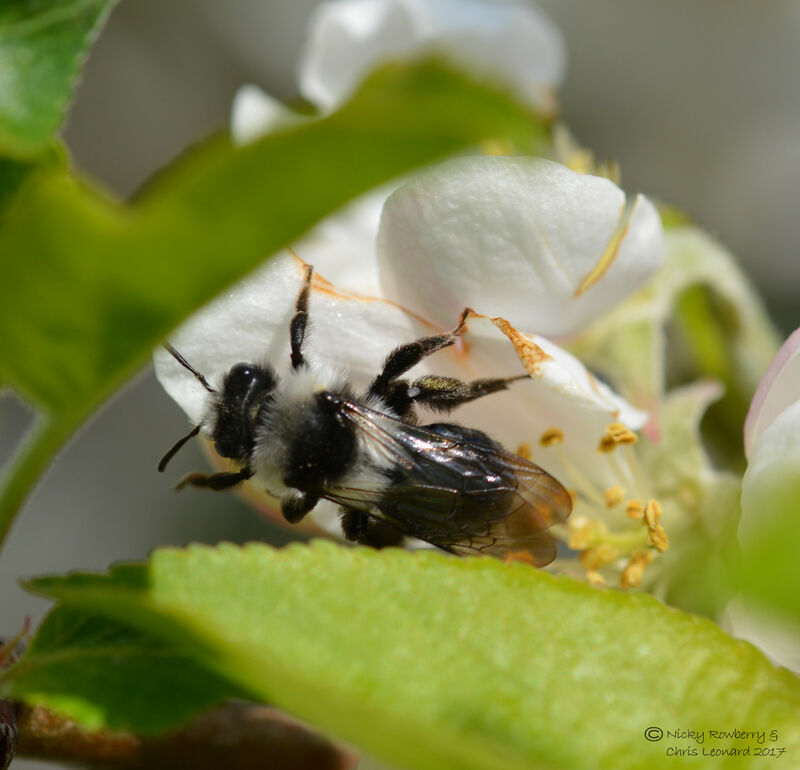 I usually only see these Ashy Mining Bees (Andrena cineraria) flying low around the grass, so it was nice to catch one up in the tree. 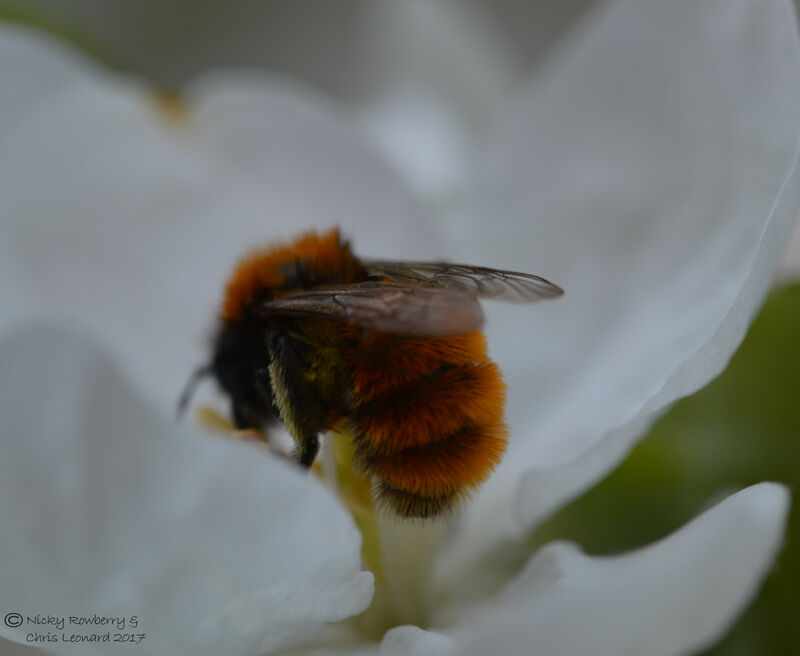 I’ve got a soft spot for this species – probably because it’s one of only two Andrena species I can identify at a glance with its distinctive black and white colouration. The other Andrena species I know easily is this female Tawny Mining Bee (Andrena fulva). The females have this amazing bright red bushy appearance. I thought we had them in the garden last year, but never managed a photo to confirm. 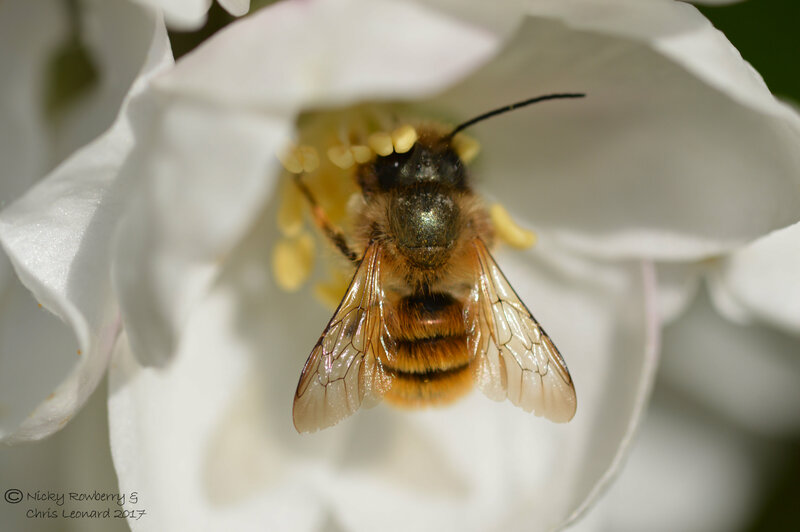 This year I finally snapped one, which made it the 27th confirmed bee species for the garden (actually now at 28, but more on that in another blog post). 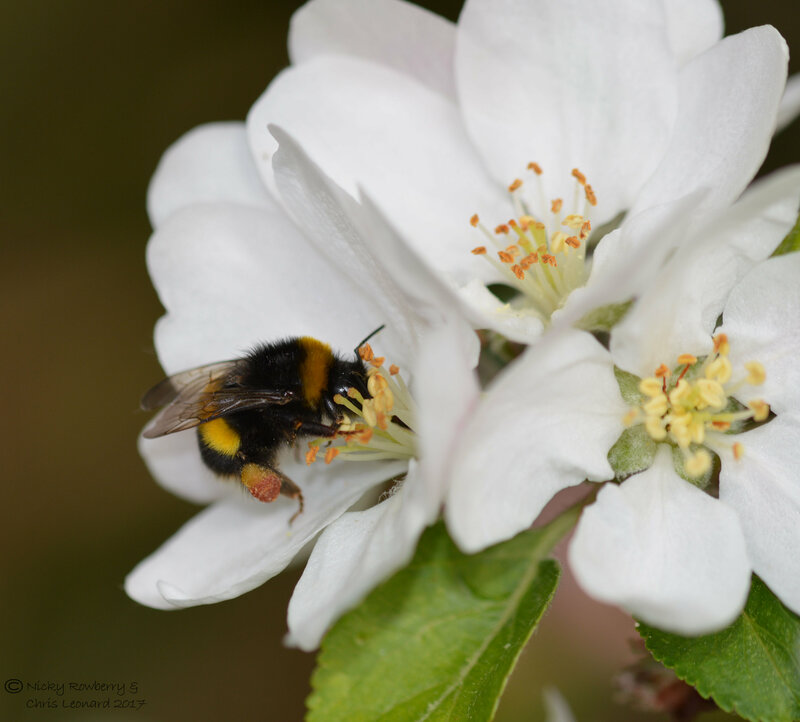 As well as the above, I’ve also spotted Hairy Footed Flower Bees, Red-tailed Bumblebees and at least one other Andrena species making the most of the blossom. 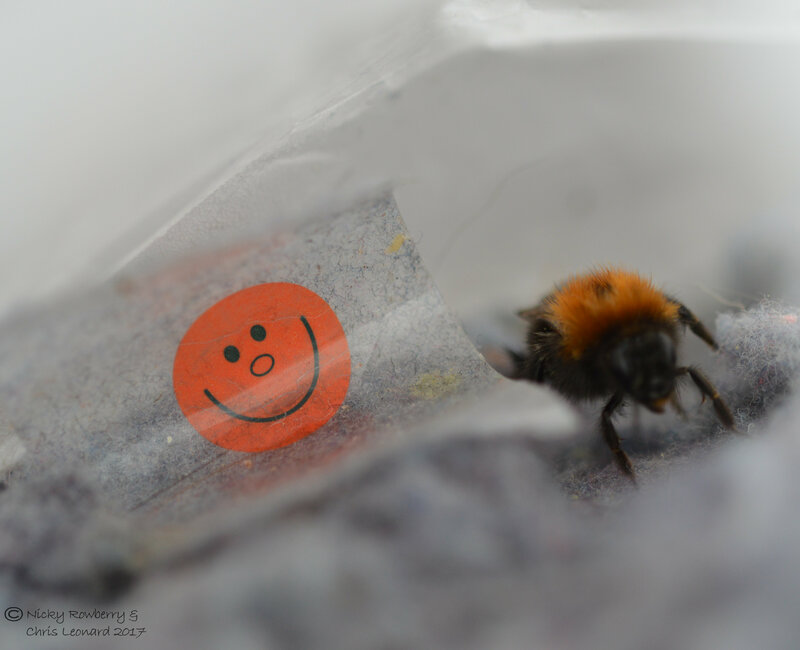 The final one that I actually managed to get a (bad) photo of was this Tree Bumblebee (Bombus hypnorum). 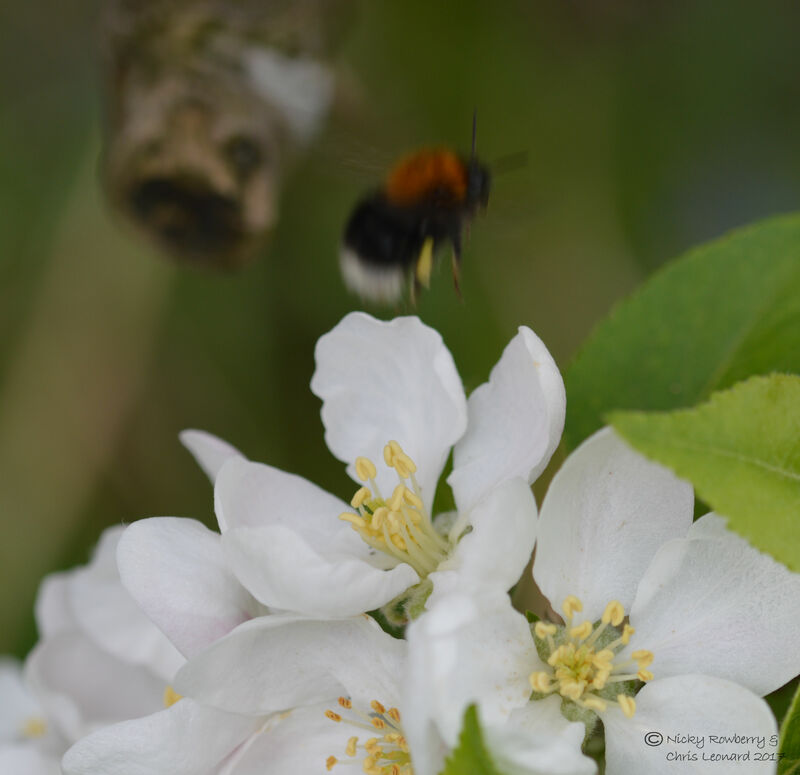 These relative newcomers to the UK are one of our most frequent and distinctive bumblebees in the garden. The Tree Bumblebees have also turned up in a most unlikely place this last week. 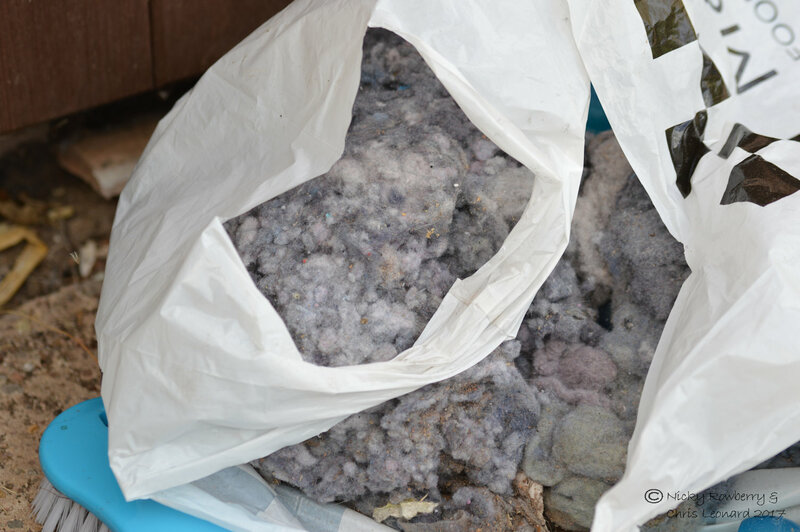 Our next door neighbour was clearing out his garage when he moved a bag of waste fluff from the tumble dryer. Much to his surprise the bag was full of bees! 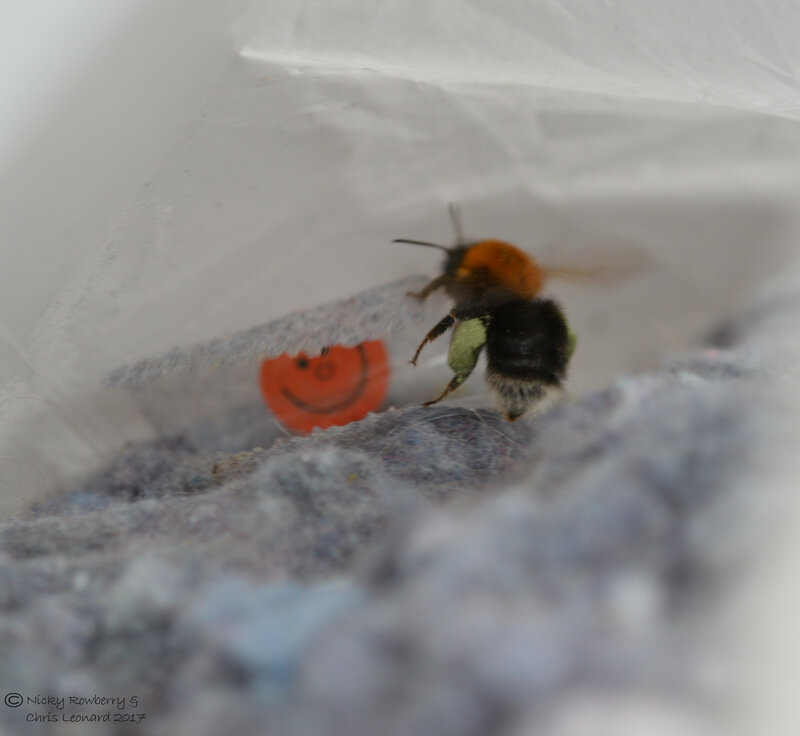 A colony of Tree Bumblebees had decided that a bag of tumble dryer fluff was the perfect place to nest and they weren’t happy at being moved. I offered to take the fluffy bag of bees, but with hindsight I should maybe have thought it through first. I put the bag under a lean-to cover we’ve got, where we sit out if it’s raining. Unfortunately this is probably where it’s going to have to stay. I can’t leave it out in the open, as the fluff will probably set like cement if it gets wet and I don’t want to entomb the bees in their nest. I also daren’t move it again as it might crush the nest. So we’ll have to share the lean-to with a bag of bees for the summer. 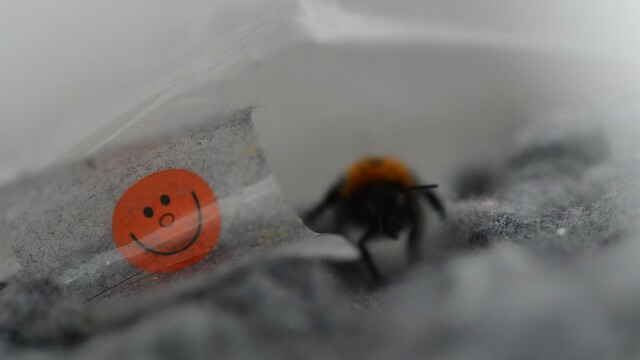 I then spent about an hour yesterday lying flat on the floor trying to get photos of the bees coming and going from the bag. 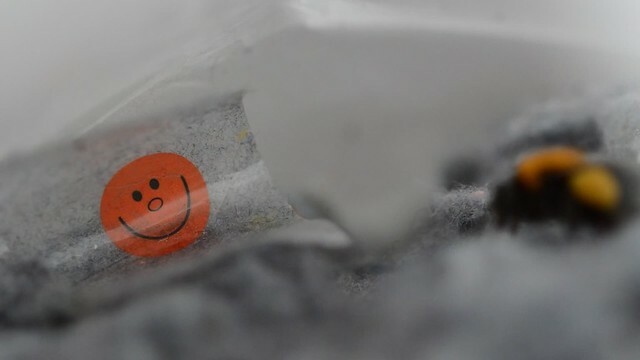 As it happens they seem to be accessing the nest right next to a small smiley face sticker that’s somehow ended up in there amongst the fluff. It makes me smile every time I look at these photos! The Tree Bumblebees aren’t the only ones to have been popping up in unexpected places. The new nest box that we put up back in January has unfortunately not attracted any nesting birds yet. 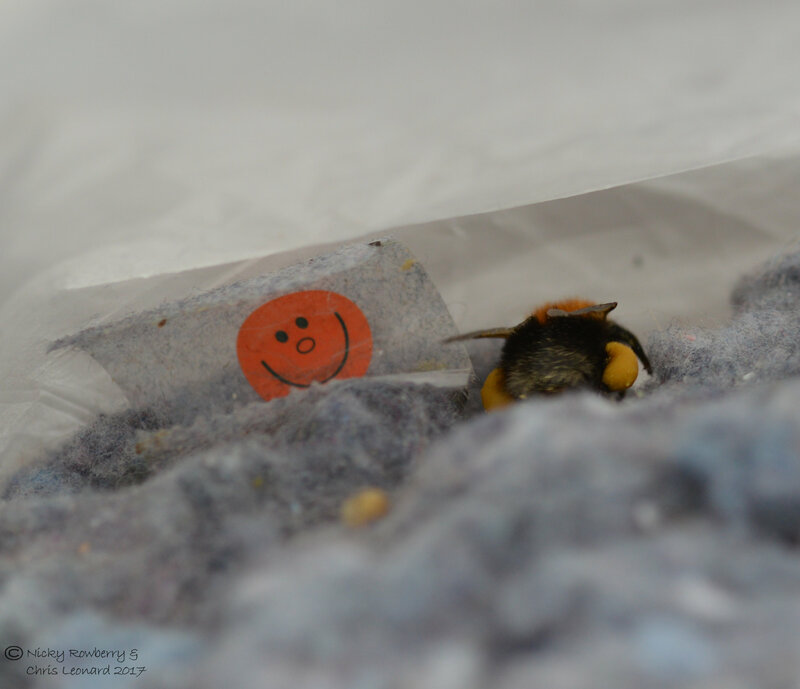 But I was surprised to spot this large bumblebee bouncing about inside it a few weeks ago. I’d have settled for a bee nest in the absence of a birdy one, but after a few minutes clumsily wandering around, it buzzed off. So it’s only April and we already have, quite literally, bags of bees in the garden!